Last week’s visit to the Nestlé test kitchens definitely put me in the mood to bake cookies. I have been looking forward all week to share these with you, I was so pleased with how they came out. 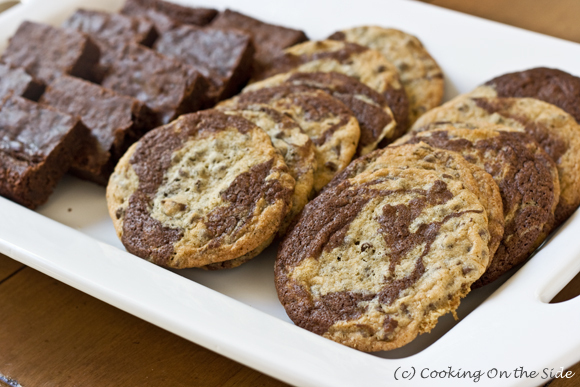 For these Brownie-Swirled Chocolate Chip Cookies, I combined two on-the-package Nestlé recipes – Mini Morsels Cookies and Dark Chocolate Brownies – to create one pretty cool-looking cookie that tastes, if I may say, even better than the sum of its parts. If the idea of swirling brownie batter into cookie dough sounds to you like something Jenny from Picky Palate might have come up with, you’re right! My supremely creative friend Jenny is the reigning queen of combining treats to make exciting new ones (her Oreo-Stuffed Chocolate Chip Cookies are all over the food blogs right now). When I got it in my head that I wanted to combine brownies and cookies I looked to the technique she shared several years ago that ensured big bold swirls without “muddying” the dough. It worked like an absolute charm. Read on to learn the easy technique for swirling brownie batter into cookie dough…plus a fabulous baking giveaway from Nestlé! To get nice, clean brownie swirls into your chocolate chip cookie dough, you first transfer your cookie dough to a baking pan. 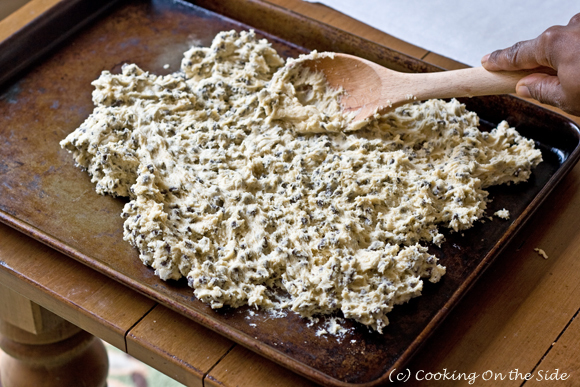 Spread out the dough into a thin layer. You don’t have to fill up the pan or anything. All you’re doing here is spreading out the dough to make it easier to scoop out the cookies – with brownie swirls – later. Drizzle about a half a cup of brownie batter over the cookie dough. Yes, you’ll have extra brownie batter. No, this isn’t a problem in the least (you’ll bake the rest in a separate pan). Go in with a toothpick and gently swirl the brownie batter into the dough. Don’t go too crazy with the swirling – the less combining you do the more distinctly the swirls will appear. Lastly, scoop out your cookies. Jenny recommends using a cookie scoop. Since this is the one kitchen utensil I don’t happen to own I used a regular ice cream scoop and it worked just fine. Do your best to keep the brownie batter on top, that way your swirls will appear on the top surface of the cookie rather than on the bottom (as I learned). I scooped out golf ball-sized amounts of dough. And there they are! They kind of remind me of the planet earth. 🙂 You can taste the difference between the brownie and chocolate chip cookie parts, but the entire treat has the chewy-crisp consistency of a cookie. There’s enough brownie batter leftover for a 9″x9″ pan of incredible dark chocolate brownies. 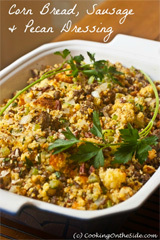 This is the recipe that keeps on giving! Leave a comment on this post sharing your hands down, all time favorite cookie. The giveaway will close on Monday, April 4, 2011 at noon PDT [THE GIVEAWAY IS NOW CLOSED]. 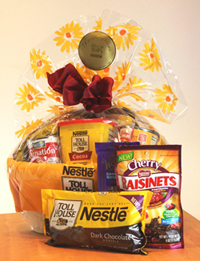 I will use random.org to select one winner to receive the gift basket and announce the winner in this post. Apologies to my international readers, due to shipping constraints the prize can only be shipped to U.S. addresses. 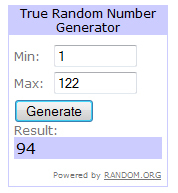 **UPDATED 4/5/2011 – Congrats to the winner! 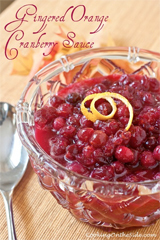 Congratulations to entry #94 – Dara from Cookin’ Canuck! Adapted from the Original Nestlé Toll House Mini Morsel Cookies (on the back of the Nestlé Toll House Semi-Sweet Mini Morsels package) and Easy Dark Chocolate Brownies (on the back of the Nestlé Toll House Dark Chocolate Morsels package) recipes. Brownie swirling technique from Picky Palate. Beat butter, granulated sugar, brown sugar and vanilla extract in a large mixer bowl until creamy. Heat sugar, butter and water in a medium saucepan just to boiling, stirring constantly. Remove from heat. Add chocolate chips; stir until melted. Stir in eggs, one at a time, until blended. Add flour, baking soda and salt; stir well. 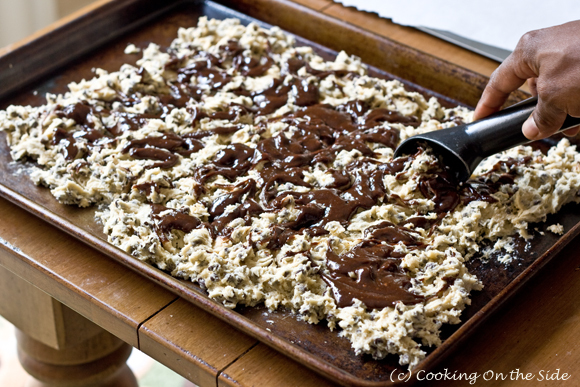 Transfer the cookie dough to a baking pan. 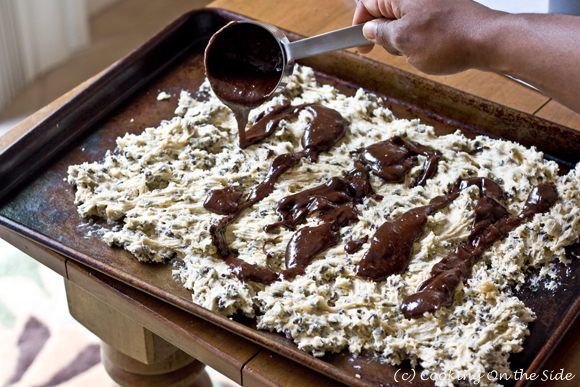 Spread out the dough into a thin layer (you don’t have to fill up the pan; you’re just spreading out the dough to make it easier to scoop out the cookies – with brownie swirls – later). Drizzle 1/2 cup of brownie batter over the cookie dough. With a toothpick gently swirl the brownie batter into the dough. 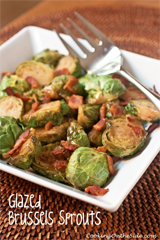 Go lightly on this – the less combining you do the more distinctly the swirls will appear. 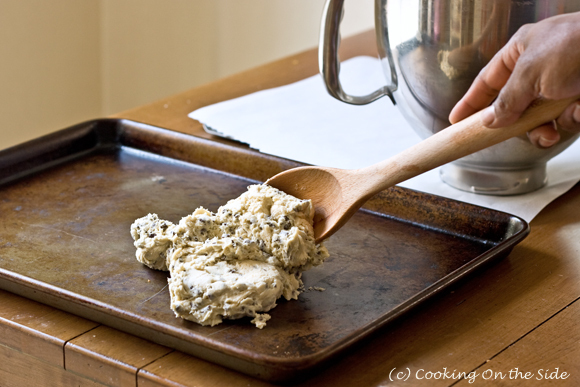 Scoop out golf ball-sized amounts of dough with a cookie scoop or ice cream scoop. Do your best to keep the brownie batter on top so that your swirls will appear on the top surface of the cookie rather than on the bottom. Transfer the remaining brownie batter (add in nuts, if desired) to a greased 9″ x 9″ pan. Bake 15 to 18 minutes until a wooden pick inserted in the center comes out slightly sticky. Cool in pan on wire rack. Cut into bars. I’ll have to say my favorite cookies are chocolate chips! My all-time favorite cookies are oatmeal with butterscotch chips, YUM! 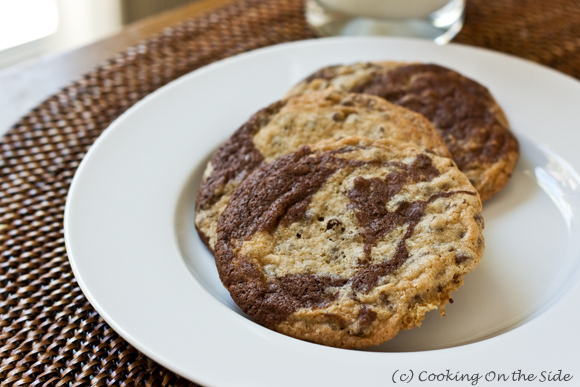 Chocolate Chip cookies- the big ones! i love me some oatmeal scotchies with coconut! my all time fav cookie is my moms peanut butter cookies! My Grammy’s chocolate chip cookies. Yum! 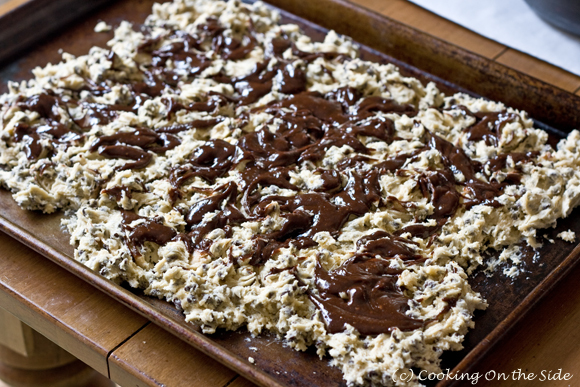 I have to admit I’m fond of magic bars, so easy and so rich! My favorite cookie recipe is regular old chocolate chip cookies! Just wanted to say those cookies look absolutely divine!